As we demonstrated in the previous article, the Doctrine of Blood Atonement, and the prophecy of Deuteronomy 32 of Israel’s last days when the blood of the martyrs would be avenged, is a critical eschatological doctrine that is, lamentably, often ignored. As promised in the previous installment, I want now to post an edited version of a paper I presented at Criswell College, in Dallas, Texas, in 2012. My paper was “The Preterist Perspective of the Millennium.” I approached that topic from the perspective of Martyr Vindication, the application of the Law of Blood Atonement. What is so interesting is that prior to the proceedings, the president of Criswell, Dr. Jerry Johnson, gathered all of the speakers, that included myself, Greg Beale, Ken Gentry, Craig Blaising, Craig Bloomberg in a back room. He urged us to not be afraid to address and rebut each other’s presentations, with proper decorum, of course. Even though I was the first speaker, not one of the speakers addressed anything that I said! Not one! It was as if I had not said anything! This was more than a little amazing and revealing, for as you can see as your read below, I did address the writings of Beale, Gentry, Blasing, etc. showing the inconsistencies of their views. With all of this noted, I want now to present the main portion of my presentation at Criswell. This presentation shows how pervasive the doctrine of Blood Atonement and Martyr Vindication is in the Bible, and how clearly martyr vindication is invariably posited at the end of the Old Covenant Age of Israel in AD 70. Isaiah, chapters 2-4, predicted the last days (Isaiah 2:2) and the establishment of the Messianic temple. Beale has done a great job in his book on the temple and the church. I recommend that book. Isaiah likewise predicted the Day of the Lord (Isaiah 2:10). Notice verses 19f, when men could run to the mountains, cry to the rocks, “fall on us.” Robinson said in his 1979 book, “exhortations or statements about fleeing to the hills and crying to the rocks, fall on us,” hardly comports with the idea of a Day of the Lord in an earth-burning, time-ending, over-in-a-moment, in the twinkling-of-an-eye event,” (John A. T. Robinson, Jesus and His Coming, (Philadelphia; Westminster Press, 1979), 74). I fully concur. Notice in chapter 3 as the writer continues, Isaiah predicted that Jerusalem “declares their sin like Sodom. They declare it, and they hide it not.” This is a direct echo back to the Song of Moses (Deuteronomy 32:32). Deuteronomy 32 – Israel’s last days; Isaiah 2-4 — Israel’s last days. Israel will become like Sodom; Israel will declare her sin like Sodom. Notice in chapter 3:18f, it speaks of the time of THE war – definite article in the Septuagint, and it’s a time of the war when Israel’s men would fall by the edge of the sword. Jesus directly echoes that in Luke 21:24, when he said, speaking of the fall of Jerusalem in AD70, that Israel’s men would fall by the edge of the sword. Not only that, it was this time of THE war, the polemos, and in Revelation 16:14, 19:19, 20:8f, we find reference to the gathering of the kings of the earth. So, Isaiah predicted the last days, the Day of the Lord, the vindication of the martyrs – and in Revelation 16:19-20, we have the motif of the vindication of the martyrs at the time of the gathering of the nations and the kings of the earth for THE war. Different war? No. It is the identical motif, the vindication of the martyrs. But this event, this Day of the Lord, when Israel’s men would fall by the edge of the sword in the war, is likewise the time of the appearing of the glorious Branch. It’s either the appearing of the glorious Branch or the glorious appearing of the Branch, whichever you prefer there. But it’s the glorious appearing of Yahweh’s Branch, and notice – in that day, God would avenge the blood guilt of Jerusalem. It’s not the church. The blood guilt of Jerusalem by the spirit of judgment and the spirit of fire. Now I want you to notice an incredible set of correspondences. Isaiah 2-4, foretold the last days; the Day of the Lord, when Yahweh would judge Jerusalem for her blood guilt. This is the vindication of the martyrs. In Luke 23:28f, Jesus was being led to his death, and the women were weeping over him, and he turned to them and he said, “Daughters of Jerusalem, do not weep for me, weep for yourselves and for your children for the time is coming in which they will… run to the hills and they will cry to the rocks, fall on us.” A direct citation of Isaiah 2:19, and of course, the parallel of Hosea 10:8. In 2 Thessalonians 1:9, as Paul writes to the Thessalonians, being persecuted for their faith. He promised them imminent vindication of that suffering and relief from that persecution at the Day of the Lord. And, he quotes from the identical verse from Isaiah (2:19) that Jesus himself applied to AD70, and he quoted it to promise the imminent vindication for Thessalonian martyrs. But that’s not all. In Revelation 6:9f, the souls under the altar had been slain for the word of God and the testimony which they held, they cried out for vindication, “How long, O, Lord, holy and true, do you not avenge us on the earth?” They’re told to “rest for a little while;” they weren’t told to rest for thousands of years. They were told to “rest for a little while,” and the answer to their prayer is the great and awesome Day of the Lord. But note that John quotes from Isaiah 2:19, the identical verse from Isaiah that Jesus applied to AD70 in his, John’s, prediction of the imminent Day of the Lord for the vindication of the martyrs. My question is, therefore, what is the hermeneutic of distinction? If Jesus applied Isaiah 2- 4 to AD70, and Paul and John quoted from the identical verse, what’s our hermeneutic of distinction to say that John and Paul were applying Isaiah to something totally different? More to follow. 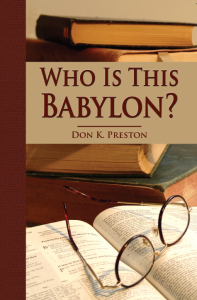 In the meantime, be sure to get a copy of my book Who Is This Babylon? in which I explore and discuss Martyr Vindication and eschatology. This book contains a wealth of information on the Doctrine of Blood Atonement and the Vindication of the Martyrs.